This building was originally a national school for girls and was abandoned in 1897 when a new school was built at Coinlín near South Harbour. The stone at the entrance bearing the date 1896/7 was removed from the Coinlín site and placed here in 1986. Here also is the Capstan which had once been used on the pier at Trá Chiaráin to draw boats to their moorings. The paving around the building consists of slabs removed from the house ruins of an older generation of islanders. In 1970 work commenced on the restoration of the old school building under the direction of an tÁth, Tomás Ó Murchú , the island curate at that time. With the help of of Na Campaí Oibre (the work-camp movement) and islanders, the old ruin was for the most part rebuilt and reroofed. 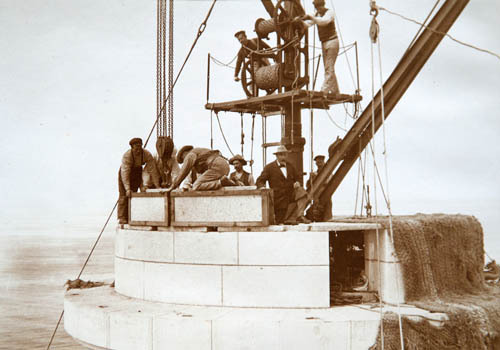 Groups of voluntary workers from Cork and elsewhere continued to help with the restoration. Roinn na Gaeltachta and AnCo / FÁS provided funding and training. In 1979, the building was first used as a museum and exhibition centre under the direction of Éamon Lankford. In 1981, a Museum Society, Cumann Iarsmalann Chléire was formed to source, collect and exhibit artifacts of island interest and develop an archive which would comprehensively detail the history, culture, and heritage of the island. Cardinal Tomás Ó Fiach officially commissioned the building as a Heritage Centre in 1986. 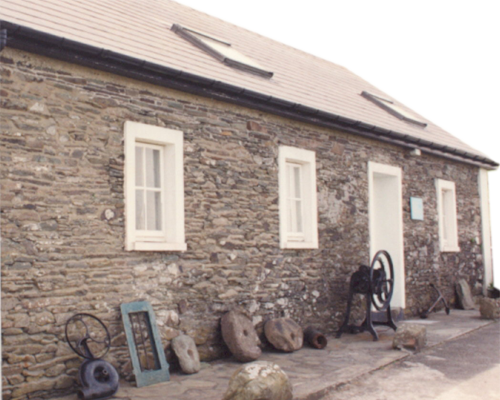 From the early 1980's to 2002, Comharchumann Chléire provided accommodation for students of Mount Mercy College, Cork, who operated the Museum in summertime in association with the Museum Society. The centre is open daily during the months of June, July and August and can be visited at other times (Winter/Spring) by arrangement with the Information Bureau at Trá Chiaráin. (Ph. 028 39190 May - September or 028 39119 all year round). The Heritage Centre includes a museum, exhibition area and archive. Many artifacts of maritime, folk and farm life are exhibited and extensive material has been assembled for the inclusion in the museum archive resource. The collection includes a number of exhibitions on specific themes dealing with island life and history, a small portion of which can only be displayed at any one time. Dr. Eamon Lankford has expanded upon each exhibition in his books, Cape Clear Island: Its People and Landscape (1999), Naomh Ciarán: Pilgrim Islander (2000) and other articles.